Yesterday I took the kids with me to spend the morning with my friend and her 4-year old daughter. The little girl, who has developed a mutual fondness for my two, calls them her 'cousins' and 'you fellas'. Late last night, as I was tucking Robert up for the night, he said to me, "Maori have big voices. She has a big Maori voice." After further reflection he said, "White people have voices like bands with no bass or drums." I was very taken with his observation. In defence of growing incapacity benefit numbers, Minister of Social Development, David Benson-Pope, is claiming the growth has slowed. Welfare commentator, Lindsay Mitchell, says this is not so and either the Minister is badly advised or he has a very poor memory. "Just over a year ago, in February 2006, the Minister said, '(T)he number of Sickness Benefit recipients increased by just 1,214, and the number of Invalid’s Benefit recipients increased by only 1,957 – a three percent rise for each respectively. We have seen a steep decline in the growth rate of Sickness and Invalid's Benefits.' "
"On April 11, 2007, he said, 'Despite an aging population, we are doing well in reducing the growth of numbers needing a Sickness or Invalids Benefit. In the past year Sickness and Invalids Benefit numbers have risen by just 4,000.' "
"So despite greater growth in the past year compared to the previous, David Benson-Pope is still making the same claim. It is bad enough that 'slowing growth' is the best the Minister can offer. It is worse still when that claim isn't even valid." A new survey about public perception of government performance conducted by Massey University, based on 1,350 responses from 18+ year-olds, shows a mixed bag of attitudes. Good; Perceptions of the role of government have changed relatively little over the past 10 years, except for a sharp decline in the expectation that the Government should provide a job for everyone who wants one. Good; .....and law enforcement. The belief that low and middle-income earners pay too much tax is widespread and has increased since 1997, most sharply amongst middle-income earners. New Zealanders have liberal views on actions designed to challenge the Government. Most believe organising public meetings, protest marches and demonstrations should be permitted. Even when people with extreme views want to overthrow the Government, most believe they should be allowed to publish books or hold public meetings to express these views. Bad; There is strong support for removing GST on fresh fruit and vegetables and for more regulation of food advertising, particularly advertising to children. And just plain ugly; Concerns about smoking, drinking and obesity show up in strong support for interventions designed to reduce the undesirable effects of cigarettes, alcohol and unhealthy food. Nearly half support extending the smoking ban to include all public places, and 75 per cent support returning the drinking age to 20.
a grand total of $17,471 or 35% of government spending. It has taken me a while to find any accounting of the In Work payment and I am very glad to see it is still being classed as a benefit by Treasury despite it being paid by the IRD. Here is the crucial point, if you can bear me repeating it one more time. 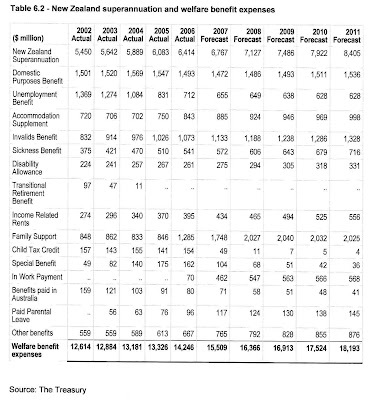 No politicians, including Judith Collins, who should have been screaming about this on breakfast TV this morning instead of making false claims like the sickness benefit pays more than the unemployment benefit, have picked up on this jiggery pokery. The sudden drop in beneficiary numbers is (to some as-yet-unknown degree - challenge the Minister, Judith) a transfer onto a different benefit now called an In Work payment. Where a beneficiary has moved from, for example, the DPB onto an In Work payment, with no change in working hours, they cease being a beneficiary. From a monetary point of view it will cost the country even more. I am not however knocking those people who are prepared to work even part-time. It is just so incredibly frustrating to watch the Minister and the opposition spokesman both so incompetent in their portfolio. While poking around in Treasury I came across this interesting graph. The top blue line shows core expenditure against gdp. That recent rise is mainly attributable to Working For Families. Given the upward trend in the first half of the decade do you really believe the prediction for the next? I asked someone, given all of the good news about dropping beneficiary numbers, what would you expect to be happening with spending? Using actual year to June figures (1st column) produces an overall rise of 8.9 percent in two years. When asked on Breakfast TV why spending hadn't dropped Benson Pope said because there was more case management going into those people who were on other benefits beyond unemployment. It's a small investment in the future. Certainly staff numbers have not gone down. BUT personnel costs are not included in the above figures. The DPB increase is, by the way, against the trend. Published last month, this report summarises patterns of reconviction amongst almost 5000 offenders who were released from prison over a twelve-month period in 2002/03. By the end of 3 years 44 percent had been re-imprisoned. I asked the Corrections Department how many people were released from prison in 2006? Answer; 12,623 people were released from a New Zealand prison in the 2006 calendar year. Just assuming the recidivism rate remains steady, 5554 people were released last year to go out and commit more crime. Note, It is of course acknowledged that reconviction figures give only an indication of actual re-offending. Surveys of crime victims indicate that, on average, between 35 - 40% of all crimes are reported to Police. Further, even when reported, not all crimes are resolved. The latest Police crime statistics suggest that resolution rates can vary from around 80% for violent offences to as low as 20% for dishonesty offences. Finally, a proportion of crimes may be “resolved” but do not necessarily progress to the conviction and sentencing of an offender (e.g., Police Diversion cases). Thus no attempt is made here to suggest that the figures in any way account for the full extent of actual re-offending behaviour of this cohort of released prisoners; these inevitably must be considerably higher. Isn't it ironic that the reasoning used against predominantly innocent people, ie a very small number of you are a risk so all will be penalised, eg dog microchipping and criminalising smacking, is oddly missing here. It can be predicted with certainty that at least half of released prisoners will go on to commit more crime against person or property, yet all are freed. All are given the benefit of the doubt. It is a very, very warped world we live in. I had forgotten I sent this out last month. It was published in today's Hutt News under the by-line of Eastbourne-based welfare commentator and former ACT candidate. I've also been writing to the Maori Party. It's not over yet. I'll be talking to Larry Williams on NewstalkZB at around 4.10pm this afternoon about teenage parenthood, welfare dependence, etc. How this is greeted will be as interesting as the research findings themselves. Christchurch Health and Development Study, Christchurch, New Zealand. CONTEXT: Young women frequently cite concerns about the effects of unplanned pregnancies on future life course outcomes, including education, employment and relationships, as reasons for seeking abortion. There is relatively little evidence as to whether abortion leads to improved life course outcomes for young women who choose this option. METHODS: Data from 492 women participating in a 25-year longitudinal study of a New Zealand birth cohort were used in regression models that examined the relationship between pregnancy and abortion history prior to age 21 and selected social and economic outcomes at ages 21-25. RESULTS: Compared with young women who became pregnant before age 21 but did not seek an abortion, young women who had an abortion had significantly better outcomes on six out of 10 measures spanning education, income, welfare dependence and domestic violence. Adjustment for confounding factors indicated that most of these differences were explained by family, social and educational characteristics that were present prior to pregnancy. Nonetheless, even after adjustment for confounding factors, young women who had abortions had higher levels of subsequent educational achievement than those who became pregnant but did not have abortions. CONCLUSIONS: Abortion may mitigate some effects of early unplanned pregnancy. However, further study of its potential risks and benefits is needed so that women can make fully informed decisions as to whether to terminate unintended pregnancies. I have always been pro-choice. Particularly in respect of teenagers. Most women will become mothers at some point in their lives. Ideally it should happen when she is mature enough to parent, is in a stable relationship and is financially capable of raising the child. Having a child as a teenager very often means the mother never attains any of those prerequisites despite continuing to produce babies. Here's Sam in her genuine, bought-at-Old-Trafford Man U shirt, getting ready for the soccer season. Ah Sweden. That utopian paradise our wanna-be social democratic government hankers after. Last week a visiting Swedish professor, Joakim Palme, told a social policy conference in Wellington that New Zealand needs to get more woman, particularly sole mothers, into the workforce. This in order to pay for the continuance of the welfare state and, in particular, the ageing population. Of course he is right - if you want a continuance of the welfare state. Women should be slaves to it to the same degree men are. Mothers shouldn't stay home raising their children when they could be tax-paying units in the workforce. They should have no choice in the matter. Then again, if you didn't want the welfare state, that is, the government prescribing how, for our own good, we should all live, you would want people to be able to make their own choices (with the important proviso that they can pay for those choices). To Barnardos and Plunket, can I be uncharitable and say, it serves you right. Murray Edridge says about the loss of support they are experiencing;"I'm saddened people choose to withdraw support because that's not a good outcome for us longer-term and it's not a good outcome for kids." And Sue Bradford's legislation will be a good outcome for kids? As I have said in the past, I am not paying you to promote dubious political solutions to child welfare problems. My eight year-old recently inquired whether her daddy and I would be splitting up. Obviously concerned (had we been fighting in front of the children or was it simply that half of her friends have gone through the experience?) I quickly reassured her, Of course not. Why would you ask? "Because then I could have two houses," she replied. A glance through the Sunday Star Times confirms a culture of blame is thriving in Aoteoroa New Zealand. The Police and the Motor Trade Association blame the rising cost of fuel for petrol drive-offs, "unscrupulous" creditors are blamed for ballooning debt and South Auckland violence is blamed on working parents. The words "criminals" and "fools" make no appearance. Most readers understand individual culpability. Even in what we might describe as trivial aspects of our lives, matters beyond the law, we know when our actions are to blame for a situation. We have an in-built mechanism - a conscience, a relatively sophisticated level of reason and a fear of bad consequences. But this pervasive practice of blaming anybody but the real culprit has led to a growing mass of people being unable to behave properly, in a way that doesn't hurt others or themselves, because they genuinely believe they are the victim, not the wrong-doer. We do people no favours by making excuses for them. But it is has become such a deeply ingrained habit I think most don't even notice it happening anymore.